GlobeCore Oil Purifier: Types of Principles of Operation - GlobeCore. Oil Purification Systems. Oil purifier machines are used in just about all industries, because of the variety of oil-filled equipment. The energy sector uses oil to insulate and cool power transformer, machine building uses oil to protect friction parts of machines, for cooling and protection against corrosion. Not a single vehicle with an internal combustion engine can move without motor oil. Industrial oils are influenced by several factors: high temperature, pressure, moisture, oxygen etc. The combined effect is deterioration of the oil, jeopardizing oil-filled equipment, which may in some cases cost millions of dollars. 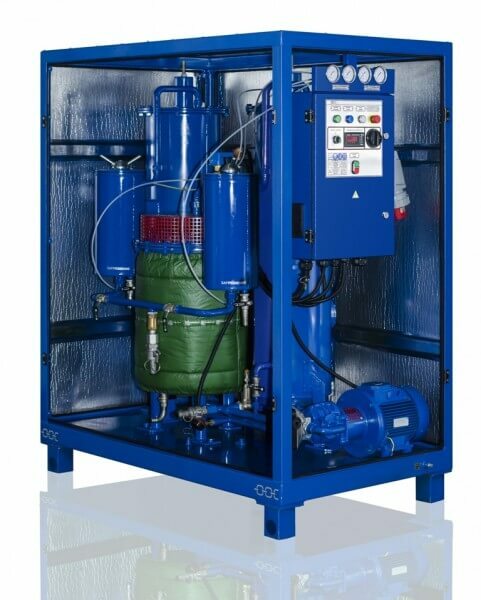 To avoid failures and associated repair costs, oil purifier machines are necessary. These units return oil to the required quality and restores important performance parameters. Industrial oil is purified by various physical, chemical or combined methods. A specific technique is selected depending on the type of contamination the the current condition of the oil. 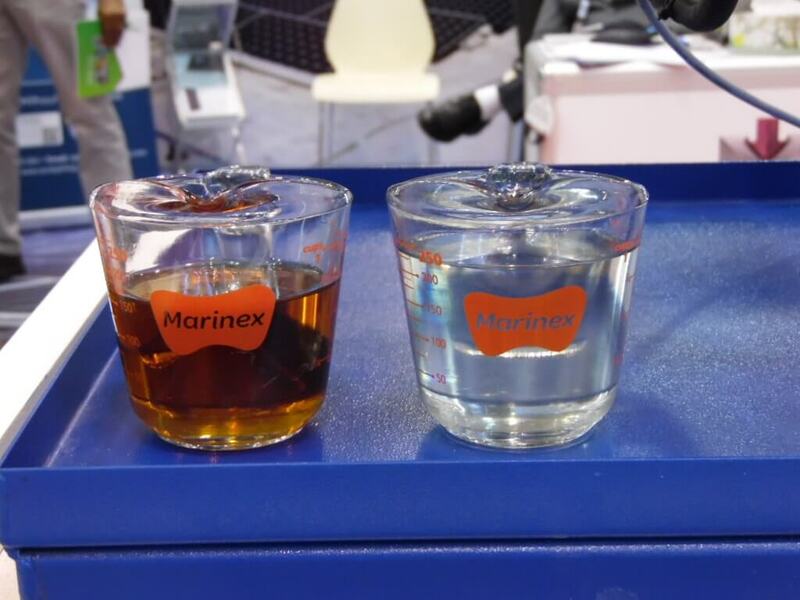 Physical methods separate the oil from the contaminants, without changing the composition of the hydrocarbons. Chemical processes involve special chemicals (acids or bases) which react with the impurities. Combined physical and chemical methods rely on both principles in various degrees. Physical processes are aimed at the removal of particulate matter and water. If the oil has not undergone significant change and contains no other impurities, it may be restored by simple settling, filtration or separation. Settling is performed in special containers. The oil remains in the container until all heavier impurities descend to the bottom of the vessel. The settled impurities are removed through a valve, leaving only the clean oil in the container. Filtration involves porous media (filters). If the particles are larger than the pores, they can be trapped within, leaving the output oil clean. Separation is a process which is possible if the oil contains impurities which differ from the oil in terms of weight, density etc. The oil is placed into a rapidly rotating drum. The rotation causes the product to separate into layers, making it possible to remove solid particles and water. An example of chemical purification is the sulfuric acid process. The acid reacts with most impurities and oxidation products, such as asphaltenes, resins, sulfuric compounds, additives etc. The biggest problem with this method is the acidic tar, which is difficult to dispose of. An oil purifier built on a combination of physical and chemical methods is most often based on the adsorption. It involves special natural or synthetic materials with developed adsorption capability. There are many types of adsorbents; each works best for a specific application or a specific impurity type. Coagulation is another combined process. This technique is based on introducing special coagulants into the oil. The impurities are enlarged, and can be settled or filtered out. 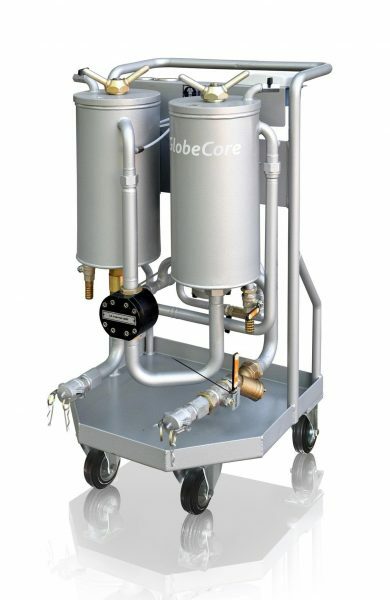 GlobeCore offers a range of oil purifiers based on single or combined purification methods. The CFU units belong to this class of equipment. They pump oil through several filters. Beside the filters, the unit is equipped with a pump, a caged motor and a control panel. There are also devices installed for reliable and safe operation: safety valves, pressure gauges and switches etc. All components are installed on a frame with a spill pan underneath, which can be installed on supports or wheels. The CFU oil purifier works with mineral and synthetic oil, removing particulate matter. It can process any oil with viscosity up to 250 cSt at 50°С. The CMM-1CF is built on the coagulation principle. This unit performs preliminary purification of industrial, hydraulic, turbine, transformer and other types of oil. The machine is equipped with filter elements (the options are 1, 3, 5 or 25 micron). After filtration, the oil passes through yet another filter, which makes water molecules coagulate into larger drops of water and flow down into a collection container. From there, the water is removed through a simple drain valve. The biggest benefit of the CMM-1CF oil purifier is its ability to process oil with large amounts of water, as much as 50% and beyond with low power consumption (less than 0.75 kW·h per 1 m3 of oil). The MCU units use adsorption. These units are filled with a load of synthetic zeolite, which is very good at removing water from the oil. The MCU oil purifier has two columns with zeolite, through which the oil passes, losing the water. Depending on the current operational needs, the columns may be used in parallel or consecutively. Zeolite purification is commonly used with transformer oil, since their dielectric strength is extremely sensitive to moisture content. After one pass through the MCU unit, the dielectric strength of transformer oil increases from 5 to 35-40 kV. The CMM class units are built on the principle of applying heat and vacuum to the oil. These units come in a great range of processing capacities производительности (from 0.4 to 15 m3/hour). 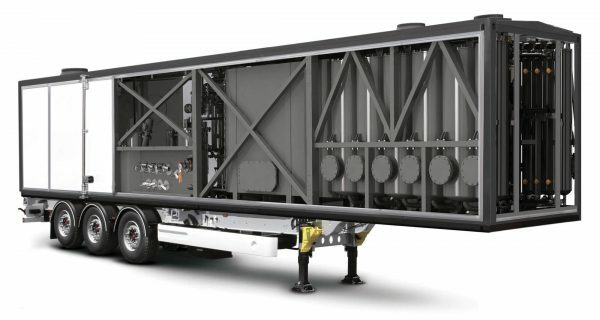 Larger units have extra functions for servicing of power transformers (evacuation, filling with oil etc). The CMM oil purifiers is an example of combination of methods: filtration, heating and vacuum. The process removes solid particles, water and gas from the oil. Oil purification processes are also implemented in the CMM-R and UVR oil regeneration units. Regeneration of oil is necessary when the oil ages past the point where it can be restored by regular purification. Regeneration also involves injection of a special additive to protect the oil from oxidation and extend its lifetime. The CMM-R and UVR units regenerate oil with special sorbent media, which absorb aging and oxidation products. These models use different media. The CMM-R units are suited for regeneration of transformer oil. The process can run without the need to drain oil from the transformer. Actually, the transformer does not have to be switched off. When the sorbent becomes saturated, it is reactivated inside the unit and can be reused for oil purification and regeneration. The UVR can regenerate various oils, such as transformer, industrial etc (with the exception of motor lube oil). When the sorbent is saturated, it can be reactivated in another machine, such as the CMM-RP. To conclude, each GlobeCore oil purifier is built for a specific purpose of our client and designed for reliability. The units are equipped with control sensors, and the operation process is automated.